It's a beautiful, livable, functional net-zero experiment -- welcome to the home of architect Shafraaz Kaba. Sitting on a corner lot, at the top of the bank of the North Saskatchewan River, the home is a tall and narrow three-story home with solar modules and a flat roof. 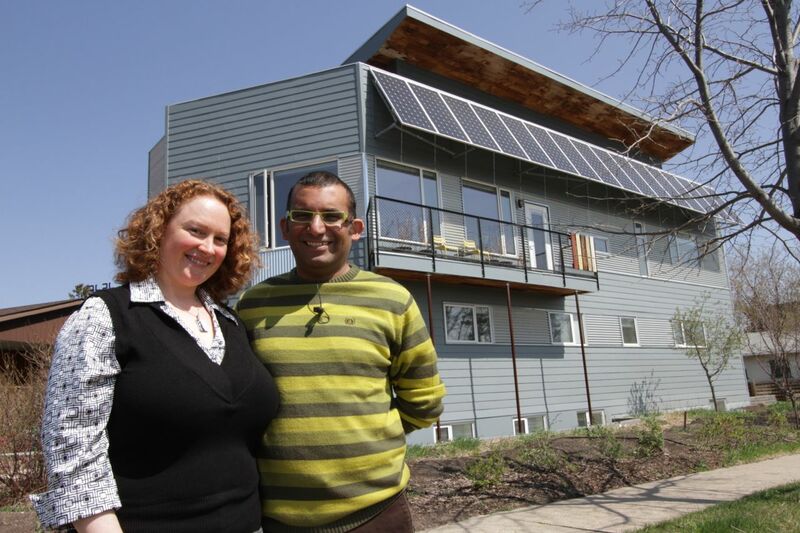 It's a beautiful, livable, functional net-zero experiment -- welcome to the home of architect Shafraaz Kaba. "As an architect, we are always testing new ideas. We are creating little experiments for ourselves to prove that something is possible, or to prove different materials work well together. We even just want to know for ourselves that things can actually work out well before we try it on clients," says Kaba. The little experiment in this case is a 2,400 square foot, net-zero ready home. Shafraaz Kaba designed it with his wife Serena Kaba and even served as the general contractor for the project. Sitting on a corner lot, at the top of the bank of the North Saskatchewan River, the home is a tall and narrow three-story home with solar modules and a flat roof. It faces due south: In fact because the house is perfectly aligned east and west, "On the equinox the sun comes through our east window directly and sets at our west window directly," says Kaba sitting in his bright, sun-drenched second floor living room. The view is amazing: the parkland of the North Saskatchewan River Valley, Edmonton's downtown skyline and even the refineries across the river in Strathcona. The Kabas loves the view. "It makes it quite lovely to live in a house bathed with light," says Shafraaz. And sunlight really is the worst kept secret of building a net-zero energy home. Shafraaz watched his industry colleagues building some of the first net-zero homes in Canada and learned that in spite of all of the amazing technology that is available, the best approach was to "keep it simple, ridiculously simple." So he designed his own net-zero home as a passive solar house with as few moving parts as possible. Shafraaz documented his net-zero project in his blog that was called "Chasing Net-Zero ," the inspiration for our series. As Shafraaz explains some of the key things you need to get to net-zero are free. "It doesn't really cost much to orientate the building as best as possible to the sun." And it only cost about $10,000 more to super insulate the walls to R56. "But it doesn't cost anymore to ensure that it is tighter and more sealed in terms of its performance," says Kaba who still has the taste of tuck tape in his mouth. "And then it's just smart to buy the best possible and efficient lighting and appliances that are available." The Kaba's home has no furnace. "The sun's heat comes through our south facing windows, which are triple paned, and we have a cement floor which is our heat sink so we get solar gain heat through our floors which gives it off at night," explains Serena. Most of the home's heat comes from passive solar energy. For backup heat they have a wood fireplace and electric baseboard heaters. And as we've seen in other net-zero homes following the keep-it-simple maxim, a simple electric water heater is used along with a heat recovery ventilator that preheats the fresh air that tight homes require. "We ended up building a passive home more than a fancy technological net-zero home. I learned a lot in the process of why passive [systems] would be better than putting in in-floor heating, which is what I thought I wanted in the beginning," says Serena. The 4.8 kilowatt solar photovoltaic array provided a third of the house's energy in 2012 and Kaba has plans for more solar PV to get all the way to net-zero in the future. After the view Serena's favourite parts of the house are "all the places where we've reused and repurposed materials and all the wonderful stories behind that." Reused church pews adorn the sills of the windows thanks to the 16-inch thick walls, the stairs were made out of leftover structural materials, parts of an old hardwood floor from a gymnasium form part of a feature wall and floor and two old cooler doors conceal a large pantry in the kitchen. The Kaba home sits at an inflection point for the net-zero movement. Net-zero homes started out as complex, large-scale affairs. Now they're simpler and much more affordable. The big challenges have mostly been solved. The rapid evolution of the net-zero home is thanks to a significant degree to the innovation of architects like Kaba and other custom builders who invested blood, sweat and tears on their own projects to help find that sweet spot that can be scaled up. And make no mistake, net-zero is scaling up. It's getting more affordable, more common and some of the big boys are already deep into the idea of building more and more net-zero homes as we will see next week in Net-zero: Go Big or Go Home. This is part three of a four part series called Chasing Net-Zero. Net Zero Homes - Keep it ridiculously simple!